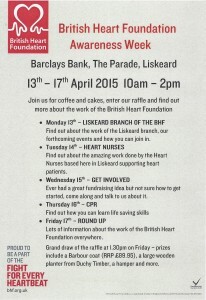 Monday 13th – Liskeard Branch of the BHF. Find out about the work of the Liskeard branch, our forthcoming events and how you can join in. Tuesday 14th – Heart Nurses. 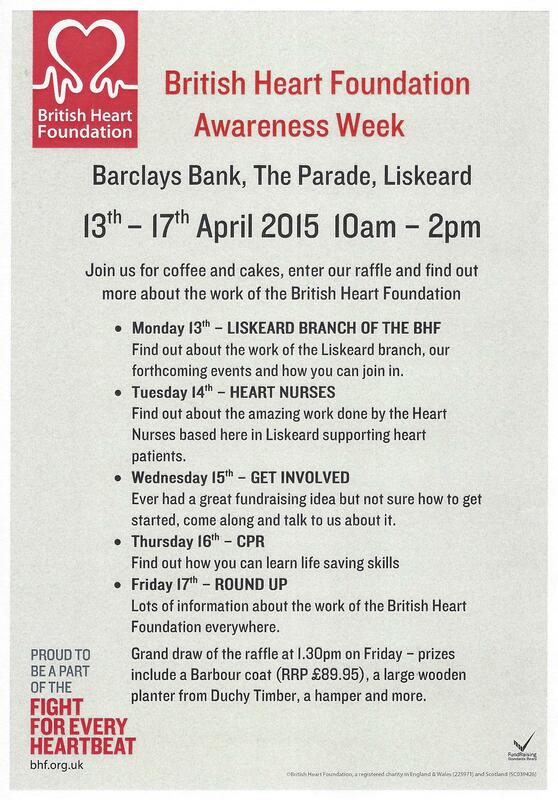 Find out about the amazing work done by the Heart Nurses based here in Liskeard supporting heart patients. Wednesday 15th – Get Involved. Ever had a great fundraising idea but not sure how to get started? Come along and talk to us about it. Thursday 16th – CPR. Find out how you can learn lifesaving skills. Friday 17th – Round Up. Lots of information about the work of the British Heart Foundation everywhere. Grand draw of the raffle at 1.30pm.